4633709 The Best of LEGO BRICKMASTER 2010 is a LEGO book that features comics and building instructions from the Brickmaster LEGO Magazine. It includes 6 sets that were included with the 6 last issues of the magazine. Each set is from either the Star Wars, Atlantis, Creator or Prince of Persia theme. You can pre-order this item but there is no official date for shipping yet. 20014 and 20015 are Creator sets. 20016 and 20018 are Star Wars sets. 20013 is an Atlantis set and 20017 is a Prince of Persia set. This is a description taken from LEGO.com. Please do not modify it. (visit this item's product page) Last chance! The best of LEGO® BRICKMASTER® 2010! 6 LEGO® BRICKMASTER® sets: LEGO Atlantis Neptune Micro-Sub, LEGO Star Wars™ Imperial Shuttle, LEGO Creator 4x4 Vehicle, LEGO Brand Prince of Persia™ Dagger Trap, LEGO Creator Crocodile and LEGO Star Wars AT-AT Walker™. 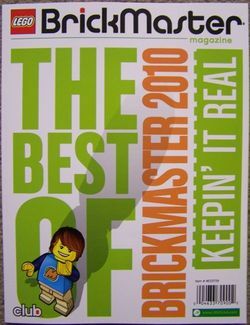 A Best of LEGO BRICKMASTER Magazine 2010 book including 200+ pages of building ideas, comics, behind-the-scenes interviews, and more exclusive content! Facts about "4633709 The Best of LEGO BRICKMASTER 2010"
Last chance! The best of LEGO® BRICKMASTER® 2010! This page was last edited on 9 January 2016, at 18:30.